Male towhees are colorful, medium-sized birds of old fields, known for their “drink-your-tea-eee” song. Towhees are declining in Massachusetts as old fields turn into forests or are used in development. Westborough has developed considerably over the past few decades, but we still have a few areas left over from the town’s farming heyday that attract eastern towhees. These birds are one of the ten most rapidly declining bird species in Massachusetts. The eastern towhee (Pipilo erythrophthalmus) is a bird of “old fields” – unused fields or pastures that have been left alone long enough for shrubs to grow in them – and forest edges. Eastern towhees arrive in the spring from the southern U.S. to nest on the ground or in the shrubs in these areas. They typically stay through September. You wouldn’t know it to look at them, but towhees are considered a kind of sparrow. We usually think of sparrows as small and drab, but eastern towhees are medium-sized and colorful. They’re about the size of a cardinal. Both male and female have white bellies and a large splash of red – about the color of a robin’s breast – on their sides. Males have a black head, back, and tail, but females are a warm brown on these areas. Both have white on the corners of their long tail. Keep an eye out for towhees in Westborough at the Headwaters Conservation Area, especially in the open area near the Andrews Street entrance, where a former sand and gravel pit is now a dry field with some shrubs. Also watch for them in the fields and forest edges at Mass Fish and Wildlife’s Westboro Management Area off Rte. 135. 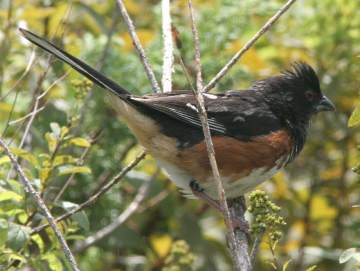 You might also find towhees along power line cuts, where shrubs often grow. 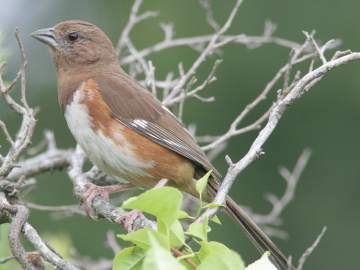 Another nearby place to find towhees is the Sudbury Valley Trustees’ Cedar Hill Reservation, a former pasture now being restored as a shrub land for birds such as towhees. You can reach it from Westborough’s Charm Bracelet trail on the north side of town, although Cedar Hill is over the line in Northborough. If you walk in one of these areas in the breeding season (probably over by now), the male towhee’s song may tip you off that it’s around. Towhees are well known for a portion of their song that sounds like “drink-your-tea-eeee.” Look up in the trees for the bird that’s singing. Female towhees are a warm brown color where males are black, but otherwise are colored much like males. They build nests on the ground or in shrubs. The towhee’s song varies, with individual birds singing 3-8 variations of their song. As with many other birds, the song isn’t directed at you. It’s aimed at other males as a way of claiming territory, or at females, to attract a mate. At this time of year, you’re more likely to hear a short whistle-like call that males and females may make at any time of year. It’s often described as “che-wink” or “tow-hee” and probably has something to do with how the bird got its name. It may serve as a kind of alarm call, inspired by your approach. The towhee is probably in the shrubbery, where cover is good, so you’ll be lucky to glimpse it. Yet another sound that can alert you to a towhee’s presence is a scratching or rustling in the dead leaves on the ground. Look around on the ground and you might spot a towhee in action. Towhees are in the habit of stirring up insects on the ground by kicking back both their feet as they hop, scratching up the dirt or leaves. Like many birds, towhees eat mostly insects during the summer. They feed soft caterpillars from the shrubbery and trees to their young, and they pick beetles and other insects out of the dirt. In fall and winter, towhees switch to seeds and berries. Their large, cone-shaped bills are especially good for husking seeds. In the fall, you might occasionally see a towhee at a bird feeder, especially if it’s near shrubs. As their diet changes in the fall, the towhees’ intestines grow longer to allow more time to digest tough plant material. Why are towhees declining in Massachusetts? It’s probably a case of habitat loss – in particular, loss of nesting areas. As farms were abandoned in the first half of the 20th century, farmlands gradually became old fields with shrubs. These areas were good places for eastern towhees to nest. Since then, the old fields have been turning into forests, and development has been claiming many fields and forests. Eastern towhees have been steadily declining in the northeastern U.S. at least since 1966. They’re reported to be declining at 3-4 percent a year. Enjoy a glimpse of a towhee if you manage to get one, and be glad that Westborough has preserved some areas where they still come to nest east each year.